In less than two weeks, CANNIBAL CORPSE will join Morbid Angel for a co-headlining run on this year’s edition of the Decibel Magazine Tour. A once-in-a-lifetime bill, the trek finds the two legendary death metal units sharing the stage for the first time ever in America. Support will be provided by rising Bay Area brutalizers Necrot and space-obsessed Denver death dealers Blood Incantation. The full tour runs from February 17th through March 14th. 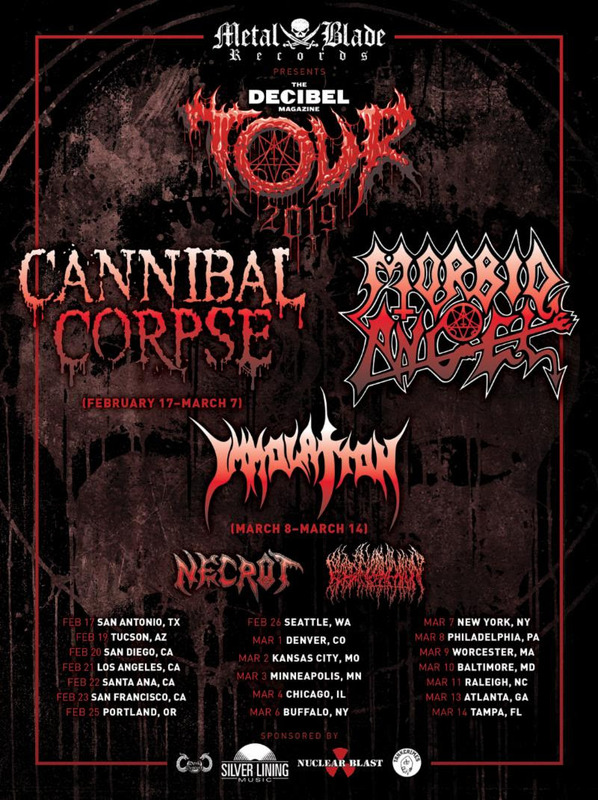 CANNIBAL CORPSE will exit the tour following the New York City date on March 7th. Immolation will join the caravan in its final week serving as main support to Morbid Angel. As previously announced, Erik Rutan will fill in for guitarist Pat O’Brien on all upcoming CANNIBAL CORPSE dates as O’Brien tends to personal issues. Rutan has produced four albums with CANNIBAL CORPSE (Kill, Evisceration Plague, Torture, Red Before Black) and is uniquely equipped to fill the role – he is one of the death metal’s most acclaimed guitarists and is known for his time as part of Morbid Angel throughout the ’90s and early 2000s, as well as handling vocals/guitars and production duties for his current band Hate Eternal. The latest issue of Decibel includes exclusive interviews with both CANNIBAL CORPSE and Morbid Angel as well as with tour’s co-conspirators. Don’t miss this issue! Order yours today at: https://store.decibelmagazine.com/collections/back-issues/products/march-2019-173. In May, CANNIBAL CORPSE will play Leg Five: North America of Slayer’s Final World Tour. The journey begins on May 2nd in Phoenix, Arizona and runs through sixteen cities, concluding on May 25th in Mansfield, Massachusetts. Additional support will be provided by Lamb Of God and labelmates Amon Amarth. To preview and purchase Red Before Black, visit: metalblade.com/cannibalcorpse. 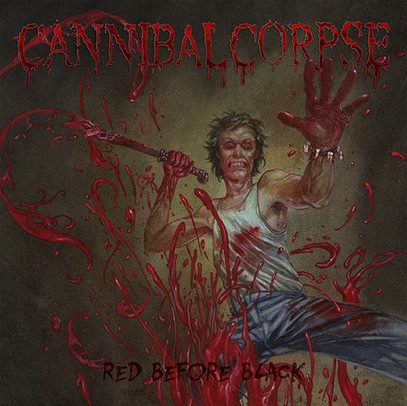 CANNIBAL CORPSE released their acclaimed Red Before Black full-length last year via Metal Blade Records. This entry was posted on February 9, 2019 at 9:30 am and is filed under concerts, Heavy Metal, Metal, metal music, Music, music news, news, rock music, world news with tags cannibal corpse, Death Metal, Extreme Metal, metal odyssey, Slayer, Thrash Metal. You can follow any responses to this entry through the RSS 2.0 feed. You can leave a response, or trackback from your own site.